COMBINING art with the world or work has proved to be a winning combination for Middlesbrough-based Python Properties. It’s three years since the property developer opened an art gallery in its Middlesbrough office block, Royal Middlehaven House. Today, despite the tough economic climate, the building is fully let with bosses citing its arts strategy as a key factor in its success. Meanwhile at its site in the North-west where lettings have proved tough due to recessionary pressures, Python is about to launch its second art gallery to drive business forward. It has established smaller exhibition spaces in some of its other buildings as part of its Artwork Placement Scheme. And its first Python Studio is providing a home for creative companies to nurture their talents. “The last 12 months have been our best period to date,” said Peter Broome, partner with Python Properties. In the last three years the pythongallery, based at Royal Middlehaven House, has hosted more than 200 exhibitions. But adding in writers, poets and other performers, more than 500 artists have showcased their work at the venue. And earlier this year the pythongallery was nominated for The Arts and Business Community Award for the support it has given to artists. 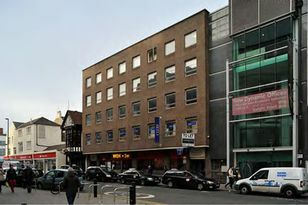 Martin Johnson, partner at Python Properties, said the gallery concept was now being adopted at its site in Warrington, Cheshire. “We’re launching a second gallery, this time in the North-west. “Warrington is an area that’s been hit hard by the credit crunch, but we know that art and regeneration work together. “The Gallery At Bank Quay House will be very similar to Middlesbrough’s pythongallery. We’re hoping it will have the same effect,” added Mr Johnson. But architectural excellence is also key to the Python team. It has restored the former Cooperative Building on Middlesbrough’s Linthorpe Road to its former Art Deco glory. Last year the building was named Best Commercial Property at Middlesbrough Council's Urban Design Awards 2009 and winning the Evening Gazette's readers' choice award. Most recently solicitors Williamson Hill have moved into the building. After an unsuccessful property search the firm had contemplated moving out of the town centre until it visited the Cooperative Building. Python will soon turn its attentions to the redevelopment of Redcar and Cleveland Council’s former home, the Cargo Fleet Business Centre on Middlesbrough Road. The building was put up in 1916 by the Cargo Fleet Iron Co Ltd, and has become an industrial landmark in the area. Forging links with Teesside University, the building will include a heritage centre - looking at the history of the local area.